uMkhuze Game Reserve was proclaimed in 1912, and celebrated its 100th anniversary in 2012. It now constitutes the north western section of the “iSimangaliso Wetland Park” (which is a UNESCO World Heritage Site). A place of great beauty and high contrasts, uMkhuze’s 40,000 hectares are renowned for an astonishing diversity of natural habitats, from the foothills of the Ubombo Mountains along its north western boundary, to broad stretches of acacia Savannah, swamps, a variety of woodlands and riverine forests as well as a rare type of sand-forest. The uMkhuze River, with a beautiful stretch of fig forest along its banks, curves along the Reserve’s northern and eastern borders. 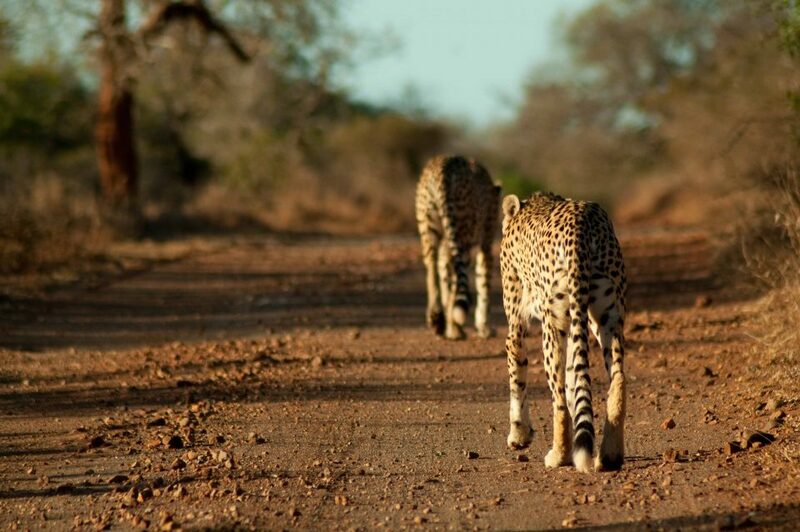 uMkhuze Game Reserve is a “Big 5” Reserve, due to the re-introduction of Lions to the Reserve in 2013. 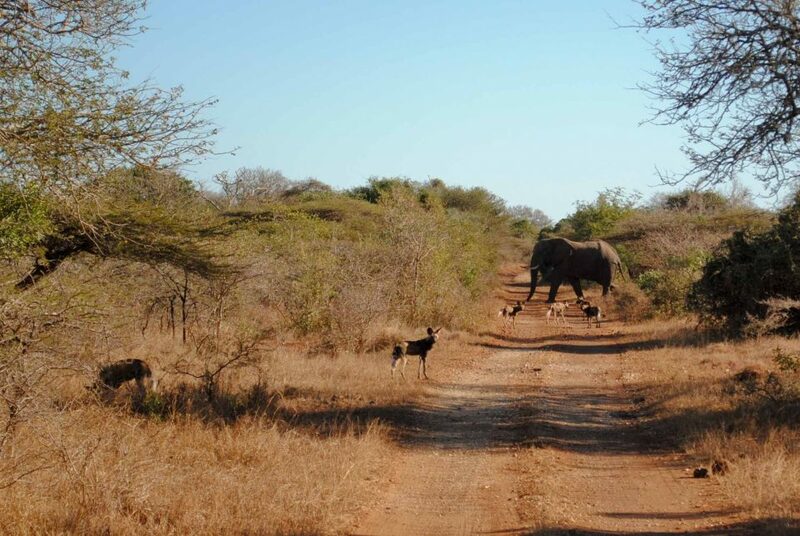 Wildlife ACT’s main focus in uMkhuze includes the monitoring of African Wild Dogs, Cheetah, Lion and Elephant. During these monitoring sessions, any potential incidental sightings of other priority species including Vultures and Leopard, would also be recorded. Three quarters of the uMkhuze Game Reserve is surrounded by local rural communities who consistently trespass onto the reserve to set wire loop snares with the intention of catching bush meat (mostly antelope). Tragically, these snares have a large unintended by-catch, which includes any unsuspecting animal that walks into the snares – including Rhino, Elephant, and very often the Wild Dogs since they cover such large distances daily in search of food. The role of the monitoring team on uMkhuze therefore includes ensuring that any snares, or wounds from snares, are reported as soon as possible, so that the necessary action can be taken by veterinarians. NOTE: A significant and very valuable component of all wildlife monitoring is the use of camera traps since they provide extra “eyes” for us in the field – especially at night. On all our projects the regular checking and rotation of camera sites (and downloading & sorting of camera trap images) forms an integral part of the monitoring work. uMkhuze volunteers are based at a small research camp, which has two bedrooms with separate shower and toilet facilities, a kitchen with an inside dining room, and an outside lounge and braai area. The camp is situated in walking distance of the main tourist camp -“Mantuma camp”, which is open to the general public and has a small takeaway/diner, a small curio shop and swimming pool. View the gallery here. The Reserve offers an abundance of wildlife, including endangered species such as Black Rhino, Cheetah, African Wild Dog and Vultures. Other animals to be found in the Reserve include: Lions, Leopard, Hyena, Jackal, Elephant, White Rhino, Buffalo, Giraffe, Blue Wildebeest, Zebra, Bushpig, Warthog, Chacma Baboons, Vervet Monkeys, Honey Badgers, Mongoose and various antelope species, including Waterbuck, Kudu, Nyala, Impala, Duiker, Steenbok and Suni. There are also a wide variety of Tortoises, Terrapins, Snakes and Lizards. uMkhuze is also famous for its rich bird-life, and its 420 recorded bird species attract ornithologists from all over the world. 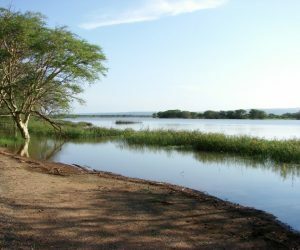 The beautiful Nsumo pan, the large natural ‘lake’ within the reserve, is host to Hippopotamus, Nile Crocodiles, Pink-backed and White Pelicans, as well as a diversity of storks, ducks, geese and other water birds which gather in spring. Nsumo supports one of only 2 major Pink-backed Pelican breeding colonies in southern Africa. Prior to the officially proclamation of the reserve in 1912, the land experienced a long history of wildlife utilization and exploitation. After 1912, the reserve continued to face challenges – specifically poaching. Nevertheless, the reserve currently holds some of the most diverse biomes in South Africa and is home to some 700 plant species, 74 large and small mammals, 450 bird species, 64 reptiles and 76 amphibians. Hand-axes dated back to the early Stone Age have been uncovered at archaeological sites on the Ndunakazi ridge of the Lebombo mountain foothills. It is also possible that pastoralists with a knowledge of iron-working, pottery and animal husbandry may have entered this area some 500 years ago. In the 16th century, Portuguese traders used Delagoa Bay for exporting ivory and other game products. By the 19th century, ivory trade through Delagoa Bay was substantial, and there was a political expansion of local states who desired to increase their share of the wealth created by this market. This expansion created conflict. In 1810 Ndwandwe expanded and attacked the Mtetwe people and looked to dominate the region from Pongolo to the Tugela River. However, the Ndwandwe came into conflict with the expanding Zulus. The Zulus were victorious and the Ndwandwe, KwaJobe and other communities migrated south. At this time the KwaJobe people were subsistence agriculturists but could not keep cattle because of the Nagana disease in the area and consequently became dependent on game for a source of meat within the present-day uMkhuze Game Reserve. Finally, by 1890 large mammals began to be protected throughout Zululand and five reserves were established in the area. Management of the reserve was handed over to the Department of Veterinary Services in 1941. 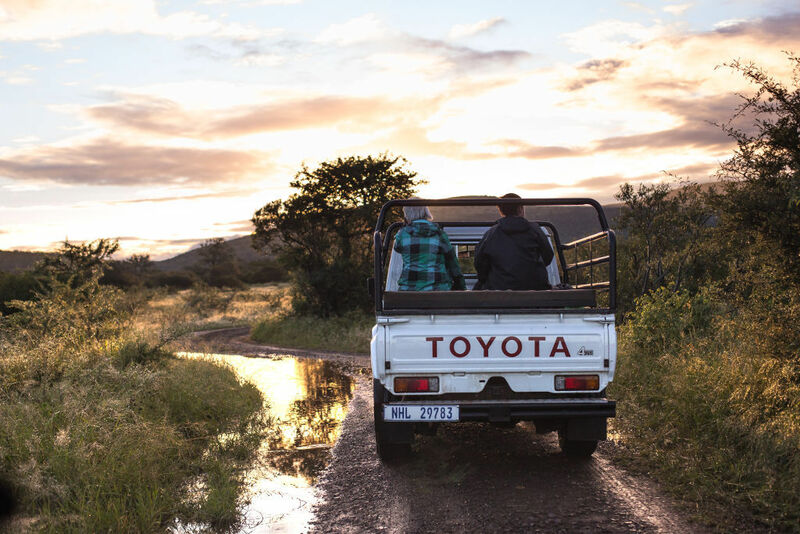 In 1953 control was handed over to the Natal Parks Game and Fish Preservation Board who continued to manage uMkhuze Game Reserve and all aspects of wildlife conservation in Natal for the next 50 years. This was until its amalgamation with the KwaZulu Department of Nature Conservation to form KZN Nature Conservation Services in 1998 and joined up with iSimangaliso’s Wetland Park, which forms part of UNESCO’s world heritage sites. uMkhuze Game Reserve has reintroduced species such as Lions and African Wild Dogs in recent years due to continued game utilization and poaching. Large predators pose a threat to the surrounding community’s cattle and the private ranching industries’ assets such as Nyala, which is a source of income to maintain and operate the reserves’ infrastructure. The monitoring within the reserve is critical not only for research purposes, but to ensure the priority species are safe within the reserves boundaries. Environmental education and collaborative conservation goals are an on-going strategy to ensure that species such as lions, wild dogs, elephants, cheetahs and several more, are not considered as a threat, but rather understood as important to biodiversity conservation just as much as any naturally-occurring organism within uMkhuze. Intensive monitoring is required 365 days a year, and twice on a daily basis to avoid human-wildlife conflict and to protect the biodiversity within uMkhuze’s boundaries. Anti-poaching teams patrol the reserve on a 24/7 basis to not only protect the endangered species within, but also to collect data via cyber-trackers for the ecological management of the reserve.